On this site you will find plenty of currency trading tips to help you make bigger profits but here, we will give you an essential list of 10 of the best currency tips which can help you get on the road to currency trading success – let's take a look at them in more detail. Here are your top currency trading tips for success and there in no order of importance – there all important! If it looks to good to be true it probably is so – avoid all the cheap FOREX robots which offer you huge gains with no efforts and the gurus, who claim they know the secret of currency trading success are not telling the truth. 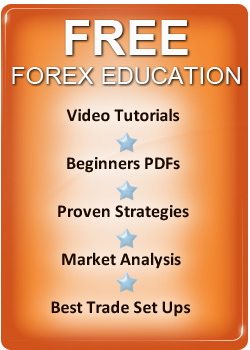 Instead, get yourself a decent FX trading education and learn the basics. You can get 200:1 leverage with many brokers but if you leverage to much you will lose. For novice traders, 10:1 is plenty of leverage to use. If you use sensible leverage you can still target triple digit gains and keep risk at manageable levels. If you engage in trading short term moves you will lose money and you can read more about it in our section currency day trading. In conclusion though, all volatility in short term time frames is random therefore, you can't get the odds on your side and that means you will lose. If you focus on the longer term trends which last for weeks months or years, you will make a lot less effort and make a lot more money. If you lack the discipline to hold long term trends, you can always try swing trading which tries to catch moves which last between a few days and a week. There are many theories that tell you that you can predict the future and three of the most popular are - Elliot Wave Theory, Gann trading Methods and Fibonacci trading strategies but none of them are scientific. Follow any theory which claims it can predict the future and the predictions will be as accurate as your horoscope. Simple currency trading systems work best and always have. The reason why they are more likely to be more profitable is simple – there more robust, with fewer elements to break than complex ones. Currencies are volatile and the daily volatility can be quite large yet, traders continue to make the mistake of trying to trade with 10 or 20 pip stops. If you do this you will lose, as you stop is within random volatility. You need to take a risk to make a reward so get used to using 50 – 100 pip stops. Forget people who say you can trade with 90% accuracy – you can't. The best traders in the world probably make money on 30 – 50% of their trades but the reason why they make so much money is - there winners are far bigger than their losers which means sound money management is the key to success. Leading on from the point above, you need to cut your losses and run your profits to make money long term trading FX markets. If you do this, you can make a lot of money. You are going to lose the majority of the time but that doesn't matter, if your winners are bigger than your losers. If you want to win at currency trading, you are responsible for your destiny and no one else not your broker, the system you bought or the news story you follow is responsible – you are. Your destiny is in your hands, so if you don't like taking responsibility for your actions FOREX trading is not for you. On the other hand, if you like a challenge -welcome to the world's biggest and most lucrative business opportunity. The above currency trading tips are really common sense and after reading them, you will understand that Currency trading success can be enjoyed by anyone. The best currency trading strategies are simple and anyone can learn one of these and all you need to realize its profit potential is to understand that your mindset is the key. The good news is getting the right attitude and mindset is a choice and its a choice any one can make if they want. So make the right choice and you will be on the road to long term currency trading success. To get more of the Best Currency Trading Tips and to learn, How to Trade Currencies Successfully with proven tools and strategies, you can check other sections of this site which will help you enjoy long term currency trading success.